Carolyn Waters Broe is an American violist, violinist and conductor. She was formerly faculty viola and violin instructor at several Maricopa Community Colleges. Carolyn has been the featured viola soloist with orchestras in California and Arizona. She is the Artistic Director and Conductor of the Four Seasons Orchestra of Scottsdale. She is also the Principal Violist of the Scottsdale Philharmonic. Carolyn Broe earned her Doctor of Musical Arts degree from Arizona State University. She received her Master of Arts from California State University Long Beach, and her Bachelor's in Music from Chapman University. 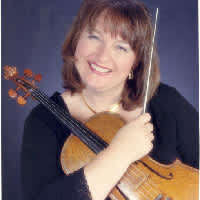 Carolyn teaches all levels of private violin and viola in her home studio, located in Scottsdale, Arizona. She prides herself in specializing in teaching beginners cello and piano lessons. Cello lessons are available also to the intermediate level student. She uses a progressive Western traditional method of teaching that has proven results. If you have a dream of learning to play a stringed instrument, I can help it come true.